The original LG G Flex was an attempt by LG to showcase its Plastic-OLED technology in a curved form factor. The device was huge with a low-res display, but it also carried a huge price tag ($299 on contract) that deterred many from considering it. In fact, we hammered on the price as a major downside in our review. With the newly announced G Flex 2 (our first look and hands-on), LG may have not only fixed the low-res display problem by switching to 1080p, but they may be introducing the phone at a much more reasonable price this time around. 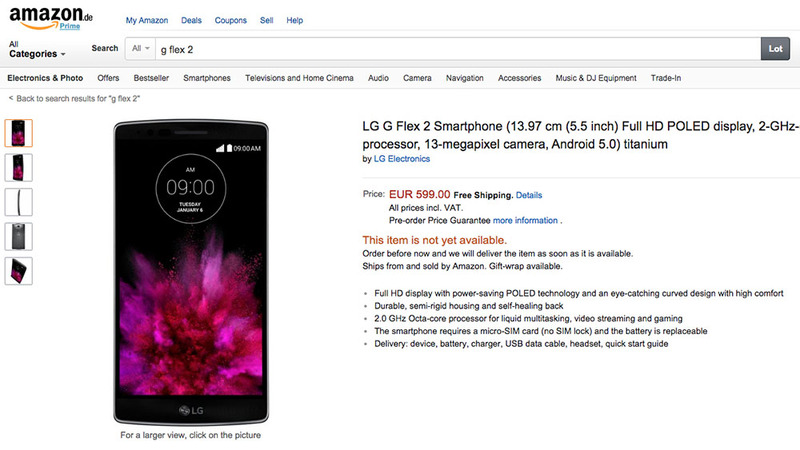 According to a pre-order listing for the G Flex 2 over at Amazon’s German store, we are seeing a price tag of 599 Euro. The device is also listed as being made by LG and shipped and sold from Amazon. This does not appear to be a third party re-seller looking to get his listing in early while the device is still a hot topic. So what does 599 Euro mean for the US? Well, we often see phones priced similarly from Europe to the US. While the Euro is worth more than the US dollar and could mean a much higher price in the US (current conversion is $706), 599 Euro could also translate to $599 or just about $599 here. Phones typically don’t run north of $700 at carriers in the US. Still interested in the G Flex 2 or are you already moving on to whatever HTC and Samsung have in store?